Python is arguably one of the best first programming languages widely used for developing web apps. It is still one of the largest and well-organized open-source projects going and it runs everywhere, from cell phones to supercomputers and supported by professional-quality installers for Windows, Linux and macOS. It is probably the easiest-to-learn programming language is widespread use and a very expressive language, which means that you can usually write fewer lines of Python code than would be required for an equivalent application written in, let’s say, C++ or Java. 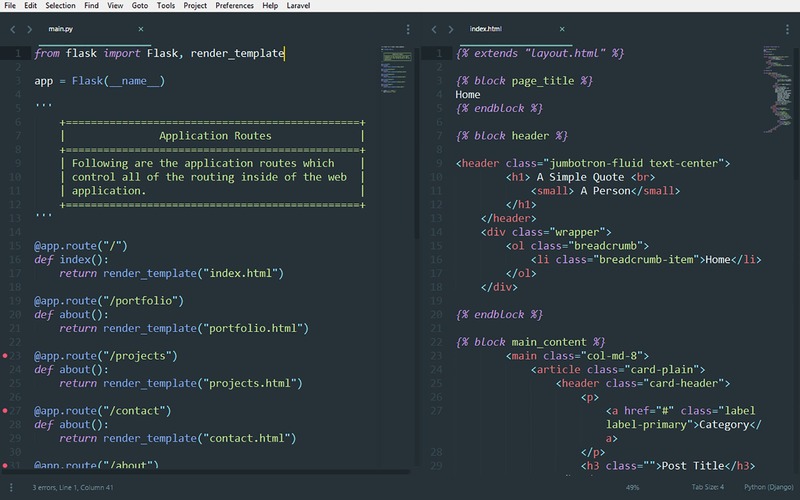 One of its great strengths in that it comes with a very standard library – this allows us to do lots of things with just one or a few lines of code. On the top, thousands of third-party libraries are also available, providing more powerful and sophisticated features than the standard library. Python was originally developed in the late 1980s by Guido Van Rossum but its implementation was started in 1989 and the first official version Python 0.9.0 was released in 1991. In 1994, Python 1.0 was released with new features that included map, lambda, filter and reduce, which aligned it heavily in relation to functional programming. Later a much powerful and sophisticated Python 2.0 was released which was a complete overhaul from its predecessors and added new features like garbage collection system, list comprehensions, and the best part , it supported Unicode. Additional features and functionalities were added further in the version 2.7 and it wasn’t enough to stop it from migrating to version 3.0 in 2008. Python 3.0 is the most stable and sophisticated version and a rather evolutionary advance on Python 2. Although, Python 3 is much better than Python 2 in more than one ways, some older practices are no longer appropriate or necessary in Python 3, and new practices have been introduces to take advantage of the functionalities of Python 3. It is currently in its version 3.6 and is a much sophisticated language than Python 2.7 – it builds on years of experience with Python 2 and simplifies some of the unwieldy syntax that was in Python 2 by adding lots of new features to make it even more of a pleasure to use than Python 2, as well as more easier and more consistent. Python 3 is the future of the programming language since Python 2 is soon to be retired. – While Python 2.7 and Python 3.6 share some similar capabilities , they should not be seen as entirely interchangeable. One of the noticeable differences between the two is that “print” statement is treated very differently in Python 2.6; it is a special statement in Python 2.6 rather than a function which does not require arguments inside an extra pair of parentheses to execute. However, print ( ) is a built-in function in Python 3.6, which requires arguments to be placed inside parentheses to execute. For example, to print “Hello Sir!” in Python 2.7, you can do so with – print “Hello Sir!”, whereas in Python 3.6, the syntax is – print (“Hello Sir!”). – Python 3 was designed to fix the flaws in Python 2, one of which is Integer Division. In Python 2.7, the return type of division of integers will always be “int” because it sees the digits after decimal points as integers and returns the nearest whole number. For example, 5/4 returns 1 instead of 1.25 and 6/2 returns 3. However, Python 3.6 returns “float” even if the values are integers, making the division of integers more intuitive. For example, 5/4 will return 1.25 instead of 1 and 4/2 will return 2.0. – In Python 2.7, there are two built-in functions that generate a sequence of numbers and they include range( ) and xrange( ). In Python 2.7, the xrange( ) function is used to create iterable objects. However, the xrange( ) function is replaced by the range( ) function in Python 3.6, so a separate xrange( ) is not required anymore. The range( ) function is much sophisticated and powerful than the xrange( ) function, although both the functions are implemented in a similar manner. Although, Python 3.6 an evolutionary advance on Python 2.7, some older practices are no longer appropriate or necessary in Python 3, and new practices have been introduces to take advantage of the functionalities of Python 3. Python 3 is the future of the programming language since Python 2 is soon to be retired. Python 3 was designed to overcome the flaws in Python 2 such as integer division, data types, and more. That being said, Python 3.6 is much powerful and sophisticated than Python 2.7 because it adds a lot of new features to make it even more convenient to use than Python 2.7. Sagar Khillar. "Difference Between Python 2.7 and 3.6." DifferenceBetween.net. 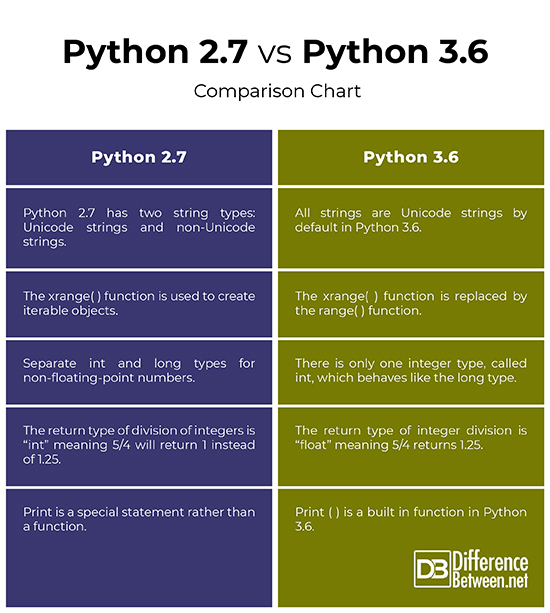 April 5, 2019 < http://www.differencebetween.net/technology/difference-between-python-2-7-and-3-6/ >.